Cartegraph OMS | AGL | Applied GeoLogics Inc. In 2014, Cartegraph redeveloped its software platform from the ground up. The result is the Cartegraph Operations Management System (also known as OMS). It is web-based, and very easy to use. The new platform is simple yet powerful. More often than not integration with other corporate systems is seamless. Best practices and standards are incorporated. An interactive map is built into almost every working environment. With over 20 years of experience behind them, Cartegraph understands what an enterprise work and asset management system must do! 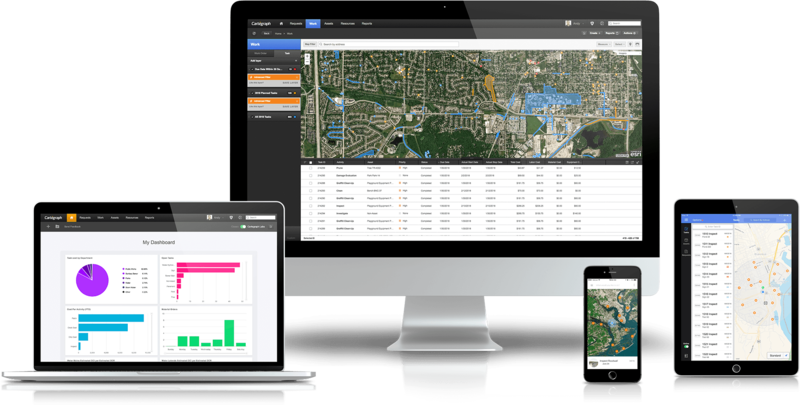 The Cartegraph OMS includes features such as request management, work order management, asset management, resources management, fleet management, and facilities management, and more – all with a consistent and easy to use interface. Out-of-the-box the system includes 65+ pre-built asset templates which can be modified or replicated using a graphical interface. Most notably, the work order management feature is second to none and is fully integrated with all other features. The Cartegraph OMS stores data in a central repository, either on or off premises, allowing all departments to easily share information and communicate with each other in real-time. Data is accessed and edited either in the office or in the field using laptops, tablets, and smartphones. Each interface can be customized so that a user will see only the information that is applicable to their role – thus enhancing the user experience. Ultimately, the Cartegraph OMS can optimize overall efficiency by removing data silos that can cause redundancy and by streamlining an enterprise-wide workflow.